Born and bred in Canberra, Richard Rolfe has always aimed high in life and business. He also doesn’t hold back when it comes to what he would like to see happen in Canberra over the next decade. “I’d like to see the city regenerated and a sporting arena in the city near the lake,” Richard stated. Looking at Richard’s drive and achievements, I’d say these are both well within his grasp. But, let’s go back and find out a bit more about the man. Richard was born at Canberra Hospital after his family relocated from Cooma. His father worked in an accountancy practice and had Beazley and Bruce Holden in Braddon as one of his clients. “When they were looking at selling the business, Dad bought it in the late 1960s. This was our entry into the motor industry,” Richard explained. Because of the success of the dealership, many other franchises approached Richard’s father to represent them in the ACT. Richard went to Red Hill Primary, Canberra Grammar and then ANU. “I studied economics, majoring in accounting. I chose economics because I was always good at maths,” Richard said. From age 16 till he completed university, Richard worked at the service station on Crawford Street in Queanbeyan. “I learned how to deal with people. It is amazing how you are treated when you are part of a service industry. Some people are friendly and appreciative and others, well, not so …” Richard laughed. Richard said that Canberra Grammar had a great focus on a balance of academic and sporting achievements. He played hockey through most of high school and then rugby in the last two years. He also played table tennis and tennis. Richard met his now wife, Debbie, at University while she was studying economics and law. He graduated in 1983 and started work in the motor industry in 1984, where he was thrown in the deep end, for his first three months, working for AGC Finance in Sydney. “I was rotated around multiple different car dealerships to fill in while their business managers were on leave,” Richard explained. He came back to Canberra and started at Slaven Mazda, BMW and Jeep as the Business Manager, looking after finance and insurance and the deliveries of all cars sold from that site – about 100 cars a month. That business grew; Mazda expanded and Richard’s brother David now owns and operates that. BMW grew to operate across the street which previously was the Mercedes business. In 1987 Richard then moved to Beazley and Bruce Mitsubishi in Belconnen as their Dealer Principal. With the expansion of Belconnen and the beginning of Gungahlin, it had grown to about 40 per cent of motor vehicle sales of the ACT. In 1994 Richard went out on his own wholesaling cars. “I did this for seven years and did a lot of work with charities and sporting organisations such as the Australian Olympic and Paralympic Committees,” Richard stated. In 2001, Richard returned to the family company and worked as General Manager for Rolfe Classic BMW in Botany Street, Phillip where he first started working in 1984. In 2006 the opportunity came up to buy the AUDI and Subaru franchises – and Richard jumped at it. “Instead of working for the family, I worked for myself running a prestige brand that at the time was averaging about six sales a month and it is now averaging around 40 to 45 sales a month,” Richard said proudly. In fact, Richard was so successful that he won the National AUDI Dealer of the Year for five years in a row from 2006 – 2011. “We more than doubled our sales in the first year. We were assisted by AUDI commencing a big roll-out of products and the service that was attractive enough for clients to not only buy one AUDI, but to continue purchasing,” Richard said. In addition to the original AUDI and Subaru franchises, Richard has also added Infiniti, Peugeot and Citron. Richard attributes much of his success to his strong involvement in the community. Richard has been on the Heart Foundation Board for a decade and has been their Patron for the past four years. His wife, Debbie, is Chair of the Canberra Hospital Foundation. AUDI has also been a major sponsor of Lifeline for many years and they are heavily involved in Home in Queanbeyan, the Ricky Stuart Foundation, the Australian War Memorial, the Royal Australian Mint and the National Gallery of Australia. What does the future hold for Richard Rolfe? Richard says that Audi will continue to grow its market share particularly given the demise of domestic production in Australia. But, most importantly, Richard says they will continue to be involved in the community. “In addition to the many other areas we are involved in in the Canberra community, we will continue to support the Canberra Cavalry, Canberra Capitals and the Canberra Raiders,” Richard concluded. 2009 Richard was awarded the Order of Australia Medal. 2014 Debbie and Richard were finalists in the ACT Australian of the Year Local Hero Category. 2016 Richard was appointed to the National Australia Day Council (which includes being part of the selection panel for Australian of the Year). 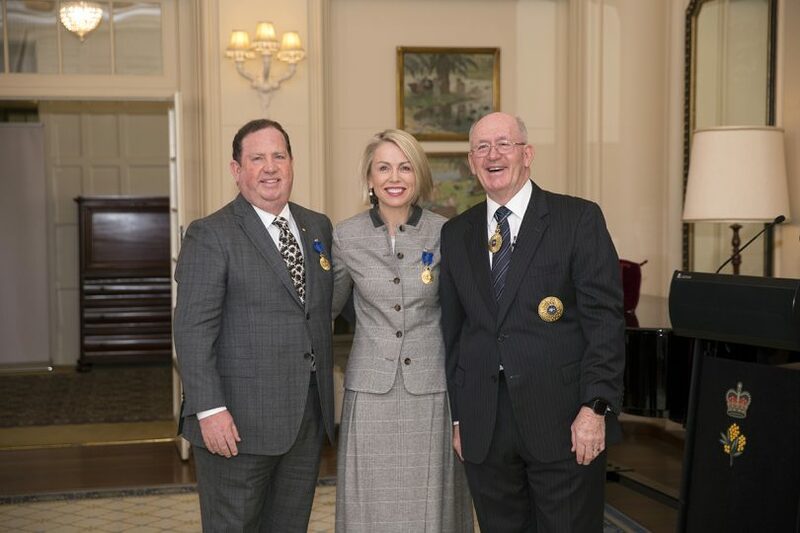 2017 Debbie and Richard were appointed Members of the Order of Australia. I noted this which was news to me. I also noted that the Renault franchise was not mentioned so I motored over to Melrose Drive in Phillip and observed that Rolfe Renault no longer exists, the premises now being occupied as stated by Infiniti, Peugeot and Citroen. Does anyone know what has happened to Renault representation in Canberra? Great review of one half of an amazing couple Debbie Rolfe.